Do you ever feel like stress is controlling your life instead of you? do you wake up in the morning feeling completely restless? Do you find yourself at the end of the day realizing you haven't eaten? Have you wondered why you're feeling so fatigued throughout your day? Are you forcing yourself to power through the day with zero breaks, snacks, or even without a few minutes of time for yourself? Do you feel like you're just not taking care of yourself? 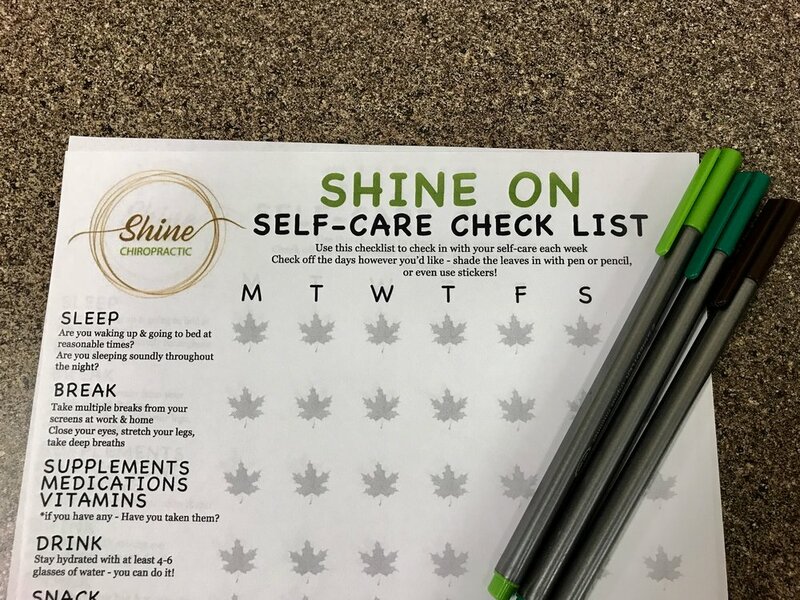 If you are struggling with maping out your day, creating a morning self-care routine, or even staying accountable with self-care - I'm here to help you get back on track with your mind, body, spirit connection with my daily self-care checklist. Half way throughout 2016, I promised myself that I would make savoring all aspects of my life a priority. I needed to slow myself down a bit and enjoy things as my life was unfolding in my life. Moving to Des Moines, starting my own business, and practicing chiropractic. It is so easy in this day and age to get bogged down in the details, and the race to accomplish everything. That can quickly become draining and exhausting, emotionally, physically and mentally. As I was embracing my new found need and love of savoring life, I kept finding a common theme popping up; one that I learned about last year and but just started to embrace. That theme is self-care. I started reading books about the benefits of mindfulness and meditation. Then I started following inspiring life coaches and other women that left me feeling like not only was it okay to take care of myself; I HAD to in order to serve my patients to the best of my abilities. How did they inspire me? In their thoughts, their words, and their ideas. So what is self-care? Is it really what it sounds like? Yes, it is. You may also be wondering why it has taken me so long to embrace this idea. I think that as women we play so many roles at once: wife, partner, mom, employer/employee, friend, daughter, and sibling. As a woman, how many times have you put yourself last? You take care of everyone else til you are depleted of energy and resources, leaving you drained. Sadly this can be a daily occurrence. Over time you become frazzled and exhausted and eventually you can’t do anything else. Self care simply means that you make yourself a priority as well. It’s really all too common to neglect or put off our own needs. Personally, I’ve never been great at self-care, especially once I became a teenager into adult hood. I let everything slide by when I became depressed and full of anxiety. Before I discovered chiropractic and my healing journey, I can really see the damage I’ve caused, all the wear and tear that is catching up with me and my body. If you are finding it difficult to get through the day at times, it’s literally your body telling you that it needs help! 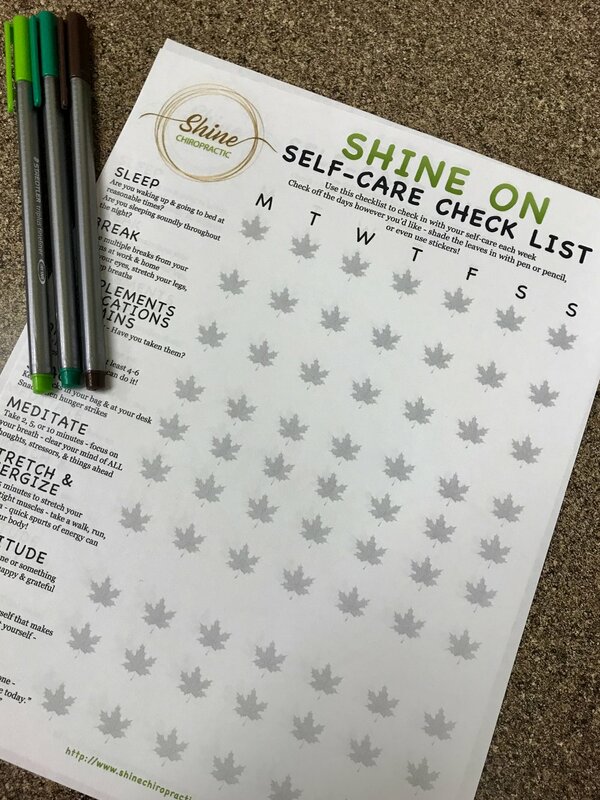 Click here to sign up to get your free daily self-care checklist! I know that much of self-care is not about a lack of education. It’s simply the neglect to address your own needs and create good habits and rituals. We probably all know more or less the things we should be doing, the hard part is actually doing those things regularly. Ever since I’ve discovered regular chiropractic care, mindful meditation, yoga, and essential oils - LITERALLY incorporating them into my day, every single day, I’ve found myself so much more mindful about self-care and realizing how much better I’m feeling with just little tweaks here and there. The key is to build my own rituals and develop self-care habits that make it easy for me to keep consistent and be more in-tune with my own body’s needs. And I should note that it’s body, mind and spirit… all parts of you need attention and care. So I decided to create myself a self-care checklist to keep track and remind myself of these important habits and rituals that I want to solidify in my life. I want to share this daily check list with you! I think everyone can benefit from checking off this self-care list on a daily basis. It’s a way to keep yourself accountable and mindful of where you stand in caring for yourself. Are you taking good care of your mind, body, and spirit? I use regular chiropractic care, essential oils, mindful meditation, and yoga within my self-care routine. Want to learn more? Contact me directly.